Let Buzzy the Knowledge Bug take your kids on a fun-filled tour of their favourite places! Junior Field Trips turns kids loose to discover exciting new places up close and on their own. Children decide where they want to go and how much they want to know. Detailed explanations, lively sound effects and colourful animation make every trip truly one of a kind. Kids will want to come back to The Airport again and again. It's a place where curiosity and understanding reach new heights - and the fun never stops. 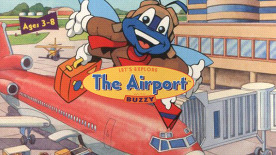 Buzzy the Knowledge Bug is your official Airport guide. He'll show you where the throttle is, tell you how radar works,- and even tell you what an altimeter is! All at the push of a button. There's no telling what will happen when you click on a float plane, the control tower, the heliport and more! Things transform and create a lively world of sights and sounds that children love. Kids can go on a scavenger hunt, track luggage through a baggage maze, colour pictures, learn fun facts, and match items with words- all in 5 fun-filled games.